There are only two species of hamster that can have black and white markings. Those are the Syrian and Campbell’s Russian dwarf hamster. Black and white patterns aren’t really seen in the wild because they’re the result of careful breeding to produce hamsters with these recessive color and pattern genes. Now, let’s take a look at some of these cuties in our black and white hamster gallery! This black and white Syrian hamster looks like he’s begging for food. Since he also looks a little chubby, we wouldn’t be surprised if he was, even though he seems to get more than enough to eat! This looks like a young hamster, and we’re hoping he’s not going to eat that fake flower! It just goes to show you how curious these little guys are since they have to check out everything they see. If you need any proof that Syrian hamsters make great pets, here it is! This panda hamster appears to be right at home on his owner’s shoulder. He’s got some beautifully-contrasted colors, too. Good morning! This black and white hamster is clearly just waking up and crawling out of her bed. In the wild, hamsters live in burrows which is why they need so much bedding in captivity. We can’t get over how cute this hamster’s little tummy is! She’s got some fun colors, and there’s no denying how adorable those tiny white feet are. Although it’s hard to tell, we believe this is a black and white dwarf hamster. It’s hard not to suffer from a cuteness overload with all of these little black and white hamsters running around. This pattern is called spotted, and it’s easy to see why. Here’s another great example of just how tame hamsters can be. This black and white girl is completely comfortable in her owner’s hand. And with a face like that, how could you resist holding her? Hamsters are natural explorers, so it’s awesome that this guy’s owner made sure he had some natural elements to climb over. He looks like he’s just spotted something interesting! This cute black and white hamster is checking out the wall. It looks like she might be trying to decide if she can climb it or not. We love her beautiful banded pattern. Here’s another black and white dwarf hamster for you! Her owner made her a cute little bed to burrow into, and it’s clear she loves it! It’s no surprise, though, since who doesn’t love a cozy bed? This is a true panda hamster as you can see by the white band down the center of his back. The term “panda hamster” was actually made up by pet stores, probably because it’s catchier than banded hamster. Only a hamster that completely trusts his owner can be so relaxed that he falls asleep in his owner’s hand, but that’s exactly what this little guy did! We can’t decide if he more closely resembles a koala or a sea otter. This Syrian hamster is getting up close and personal. She’s probably looking for treats! This shot makes it easy to understand why these animals are so loved as pets; they’re irresistibly adorable! It’s rare to see hamsters sleeping since they usually do so buried beneath their bedding, but it looks like this hamster was too tired to make his bed before passing out. We’re glad he did since sleeping hamsters are so cute! Here’s another close-up, this time with a younger black and white Syrian hamster. This guy was just brought home, which is why he doesn’t have any bedding yet. Although it may look like this hamster is playing fetch with someone, it’s more likely that she’s either taking the stick to her food storage pile, or wants to use it in her burrow. It takes some time to build up this level of trust with your hamster. It’s clear that this owner has worked hard to show her hamster that she loves him and that he can trust her. Patience pays off! We couldn’t help but add another sleeping black and white hamster. We also love the shape of this little guy’s black pattern that goes perfectly down the center of his back. This owner did things right when setting up their hamster’s cage. This sandy area is fun for digging around in, and probably makes a perfect bathroom area so the rest of the bedding stays clean! Although she looks surprised, she probably just got caught mid-bite or else mid-lick. Either way, she’s certainly a cute black and white hamster who looks like she’s enjoying herself. It looks like somebody asked for a black and white hamster for Christmas and Santa is delivering! We love that the white under this hamster’s chin makes it look like he’s smiling. While you’re still in the holiday spirit, here’s another black and white mouse enjoying that time of the year. This guy is trying to figure out what this big shiny red thing is. This squishy-faced dwarf hamster look like she just woke up and isn’t completely awake just yet. The fact that she’s so relaxed with her owner means she trusts them. Look at that white belly! Hamsters aren’t known for their ability to climb since they’re made for burrowing under the ground, but this guy is defying that stereotype and hanging onto the top of this piece of glass. This black and white hamster looks like she’s trying to strike a pose. She’s also got something on her face. Do you think she’d be embarrassed if she knew? Mixed in with cream-colored siblings is a black hamster and a black and white one. This just goes to show you how varied hamster colors can be, even within the same litter! 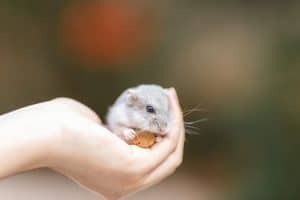 While this hamster looks enormous, it may simply be that the person holding her has a small hand. Either way, it doesn’t change the fact that she’s absolutely adorable with her black hood and white tummy! We love the expression this guy seems to be making. He looks confused as to why he’s being photographed. Or, maybe he’s wondering what happened to all his bedding! Let’s end the post with this busy black and white hamster. Hamsters need a lot of stimulation to keep them occupied, and it looks like this owner is doing it right. A busy hamster is a happy hamster! How did you like our post filled with black and white hamsters? 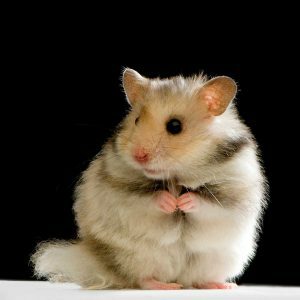 If you want more information about hamsters, then be sure to check out our blog. 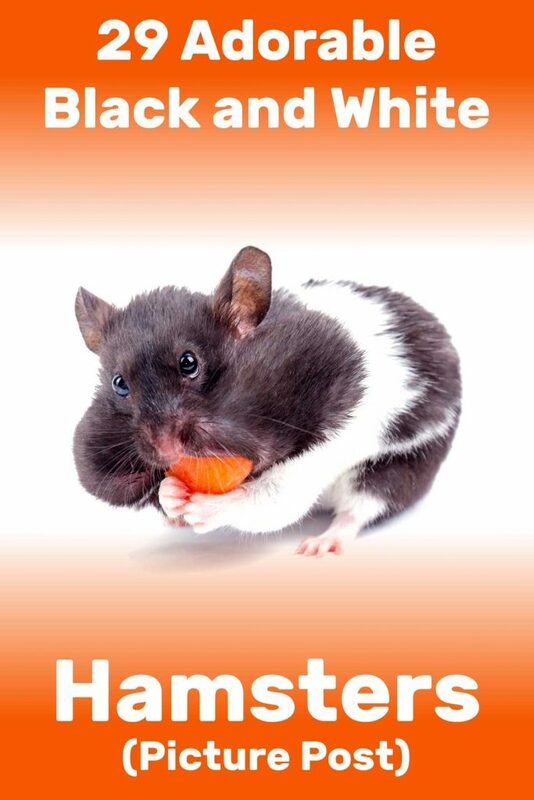 It’s got everything you need to know, including 37 hamster care tips. 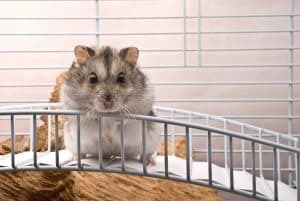 If you loved the hamsters in this post, be sure to share it!